Harajuku girl with printed top and high waist pants, blue overcoat, clutch, delicate jewelry and metallic heel ankle boots. Harajuku girl in hoodie dress, minimalist backpack and teddy bear sneakers with girl in white blouse and high waist pants, heart bag and gladiator sandals with socks. 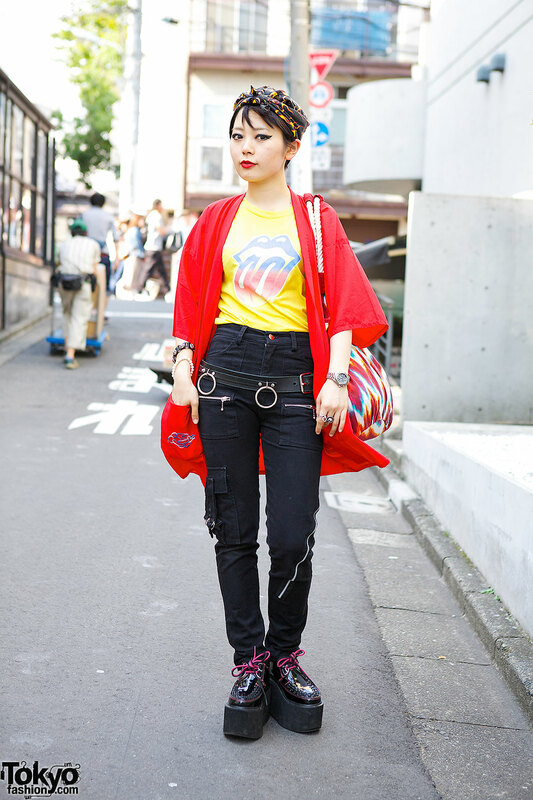 Harajuku rock girl with flames print headscarf, graphic tee and dragon jacket, high waist jeans with belt, colorful bag and patent platforms with pink laces. Harajuku girl with plaid glasses and faux fur hat, white top, high waist pants, midi coat, denim tote, and colorblock wedge sandals with white socks. A list of fashion trends that are hot on the streets of Tokyo in the summer of 2013 – with lots of Harajuku shop pictures! Harajuku girl in crop top, gingham shorts and long stocking with friend wearing denim skirt and rocking horse shoes.